I have to admit that while I am a huge seafood fan, I am not a fan of fish or shellfish tacos. But my boys are. So when I spotted shrimp tacos with lime slaw in the Better Homes and Garden Dinner on a Dollar magazine, I knew I needed to try it. As far recipes go, this one was super easy, way fast to prepare and definitely yummy. It does clock in on the higher side of dollars per serving at about $2.25. 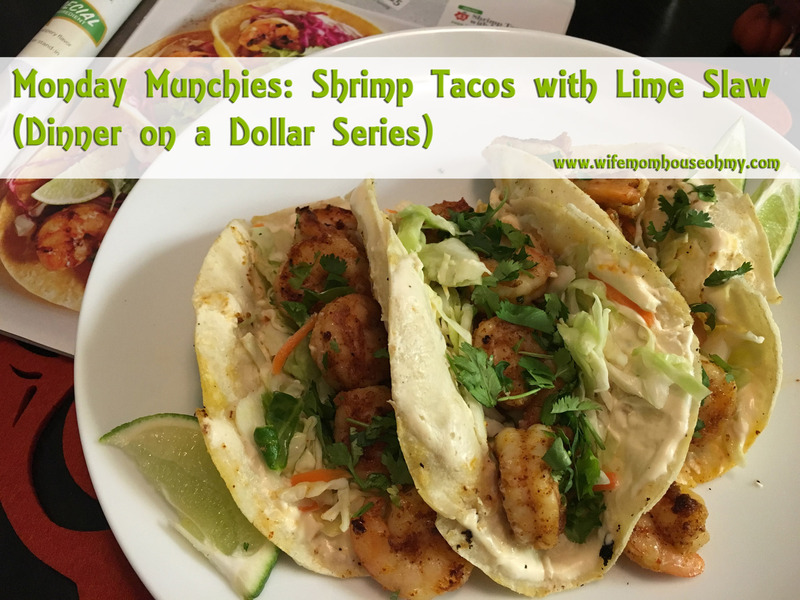 A family of four can still eat an entire meal for under $10 but as compared to some of the other recipes I have presented in this series, it is on the higher side. I do have to say its worth it. As I said earlier, I am not the biggest fish taco fan but I really enjoyed this version. As always, I made some small changes due to my allegories and food preferences. But I kept the integrity of the recipe. Instead of garlic, I elected to use onion powder in its place. No one in my family is a huge raw red cabbage fan. I happened upon a bag of ready made coleslaw in the store and thought it would be a perfect substitute. A word of advice when it comes to the canned chipotle peppers in adobe sauce – find the smallest can possible. Its not the scrotch your mouth kind of pepper. Correction: It’s not the scrotch your mouth kind of pepper if you use the right amount. Start with a few drops of liquid added to the sour cream. Add more until its to your taste level. I ended up using maybe 10 drops total from the whole can and it was plenty hot. Sound like too much work and waste, opt for tabasco sauce instead. 1. In a large ziplock bag, mix onion powder, ground cumin, chili powder and 1/4 teaspoon of sea salt. Once well combined, add the olive oil to the bag followed by the unfrozen shrimp. Seal the bag and mix the shrimp around until they are well coated. Chill in the refrigerator for about 30 minutes. 2. Add lime juice, coleslaw and remaining salt to a bowl and mix. Set aside. 3. In another bowl, mix sour cream and chipotle peppers/adobe sauce together. Taste as you go to make sure the heat is to a level you will enjoy. 4. If you do not have a grill pan, then soak wood skewers in water for about 30 minutes. Once shrimp has chilled and skewers have soaked for about 30 minutes, thread the shrimp on to the skewers. If you have a grill pan, skewers are not needed. Heat your grill pan or grill over a medium heat. Add shrimp and cook them for about 5 to 8 minutes, turning once, until they are red and opaque. 5. Grill tortillas lightly for about 5 minutes, flipping once. 6. Assemble the taco by taking two tortillas stacked together (for sturdiness – learned through trial and error, mostly error). Spread sour cream on the inside tortilla. Add cabbage and shrimp. Top with cilantro and serve with a wedge of lime. That’s it! Super easy, way fast, and definitely a yummy hit in my house.